It’s finally Friday of our first week back. We did it! It feels so much easier this year. I know both of their schools and the parents and the communities present there. 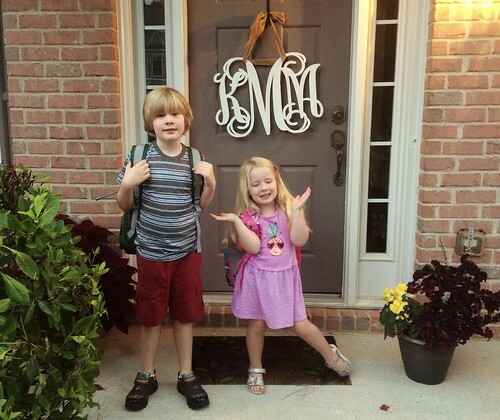 With kindergarten behind us, the hard transition is out of the way. Even though it takes some getting used to again after a few months off, the old drill seems comfortable and worn in. Both kids are hard to get out of bed in the morning though, no matter how early I get them to sleep the night before. And August is that weird few weeks of late daylight and sweaty summer temperatures set against the harsh demands of the school schedule. It’s like the dress rehearsal for what’s coming next, the prologue to fall. I’m having to constantly remind myself that it is okay to lean into what is comfortable. It’s okay to feel that things can slow down now. The last few years have been nothing but change, and then this summer with my grandmother was a huge shift in what I have known for the entirety of my life. It is not debatable that I need the rest and familiarity – as anyone would. But it makes me feel like I am always forgetting something, like I should be doing something more than keeping the pulse that strings our days together. I’m not used to standing still and having no major transition in front of me. This isn’t new anymore. It’s me. It’s the three of us. Life as we know it with a comfortable rhythm. I read a thoughtful commentary this week from Parker Palmer expanding on a Marge Piercy poem, “The Seven of Pentacles.” She explains, “Connections are made slowly, sometimes they grow underground. / You cannot tell always by looking what is happening. / More than half a tree is spread out in the soil under your feet.” It seems that way in certain seasons, doesn’t it? You cannot always tell what is happening by looking, but you can feel those roots deepening sometimes. And sometimes you can’t – even though the growth is there. I know the work I do now, in the still seasons, is giving my kids a sense of certainty and a solid ground to stand on, but in our society of make, make, make and productivity measures and checking things off a list, it can be hard not to see yourself as some sort of insufficient factory when your output slows down. I’m not sure how much sense this is making to others, though I am writing for myself as I always do – so that I don’t forget that there were moments when it felt steady and easy (easier, that is) and simple. I’m working hard to “Weave real connections, create real nodes, build real houses” as Piercy encourages in that poem. Every time growth feels slow, I’m reminding myself again and again: half a tree is spread out in the soil under your feet.